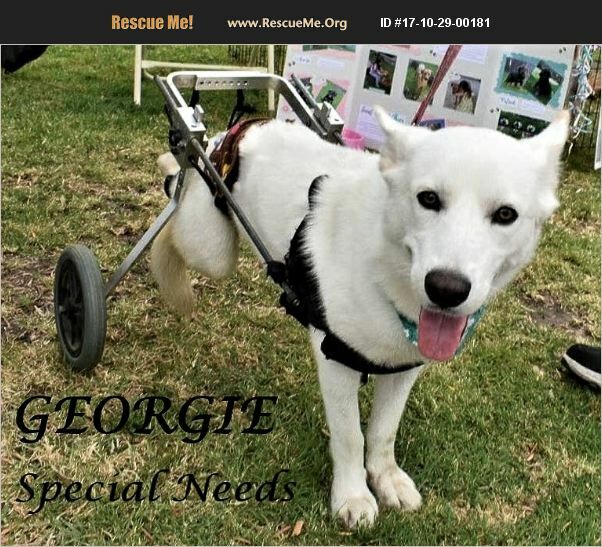 [Read About Natural Incontinence Care] Georgie is a Neutered Male 1 yr old Special Needs White Shepherd. He is current on vaccinations, good with kids, adults & most dogs, has not been around cats!!! He is paralyzed, incontinent, has lost one of his back legs recently. He does not let his disabilities stop him!!! He loves everyone and is a happy boy when racing around in his wheelchair! If a special needs pup hold a piece of your heart, then this is the boy for you!!! Georgie is looking for his Special Home!! !